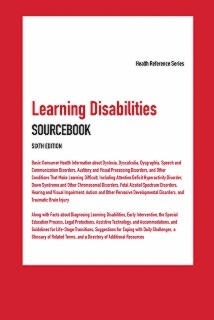 Learning Disabilities Sourcebook, 6th Ed. Learning disabilities are neurological disorders that affect the brain’s ability to process, store, and communicate information. They are widespread, affecting as many as one out of every five people in the United States, according to the U.S. Department of Education. In 2015–16, the number of students ages 3–21 receiving special education services was 6.7 million, or 13 percent of all public school students. Among students receiving special education services, 34 percent had specific learning disabilities. Learning disabilities directly impact many areas in the lives of those affected, making school difficult, making it hard to obtain and sustain employment, making daily tasks challenging, and even affecting relationships. Yet learning disabilities are invisible obstacles. For this reason they are often misunderstood, and their impact is often underestimated. Learning Disabilities Sourcebook, Sixth Edition provides information about dyslexia, dyscalculia, dysgraphia, speech and communication disorders, and auditory and visual processing disorders. It also provides details about other conditions that impact learning, including attention deficit hyperactivity disorder, autism and other pervasive developmental disorders, hearing and visual impairment, and Down syndrome and other chromosomal disorders. The book offers facts about diagnosing learning disabilities, the special education process, and legal protections. Guidelines for life-stage transitions and coping with daily challenges, a glossary of related terms, and a directory of resources for additional help and information are also included. Part I: Understanding and Identifying Learning Disabilities explains how the brain works, defines what learning disabilities are, and describes theories regarding their potential causes. It explains how learning disabilities are evaluated and provides tips on how to choose an evaluation professional. Part II: Types of Learning Disabilities describes the most common forms of learning disabilities, including problems with reading, writing, mathematics, speech, language, and communication. It explains what these disorders are, how they are diagnosed, and how they are treated. It also discusses learning disabilities among gifted students, a fairly common—but often unrecognized—phenomenon. Part IV: Learning Disabilities and the Educational Process provides information about how learning disabilities are accommodated within the schools. It describes early intervention strategies, explains how the special education process works, and details the legal supports for students with learning disabilities. Specialized teaching techniques and alternative educational options, such as tutoring and home schooling, that are used to help learning-disabled students succeed are described, and it also offers guidelines for successfully negotiating the transitions to high school and to college. Part V: Living with Learning Disabilities discusses how learning disabilities impact daily life. It includes tips for coping with a learning disability and for parenting a child with a learning disability. The impact of learning disabilities on self-esteem and social skills are discussed, and it offers suggestions to help those with learning disabilities deal with daily tasks, including meal preparation, money management, travel and transportation, and learning to drive. It also provides detailed guidelines for handling the employment issues faced by those with learning disabilities.